Holds a nalgene super tight. I have a lot of confidence in the construction. An elegant and simple solution. My favorite. I have been extremely satisfied with this bottle cage. I bolted it to my steel touring bike and, this summer, I rode across the US some 4600 miles with a 1.5 L nalgene bottle nestled in it. The trail took me through some bumpy downhills and not once did my water bottle fall out of its cage. I never even had to bend it to tighten the grip on the bottle. Even now it looks brand new. I am extremely happy I found and bought this bottle cage. Perfect! 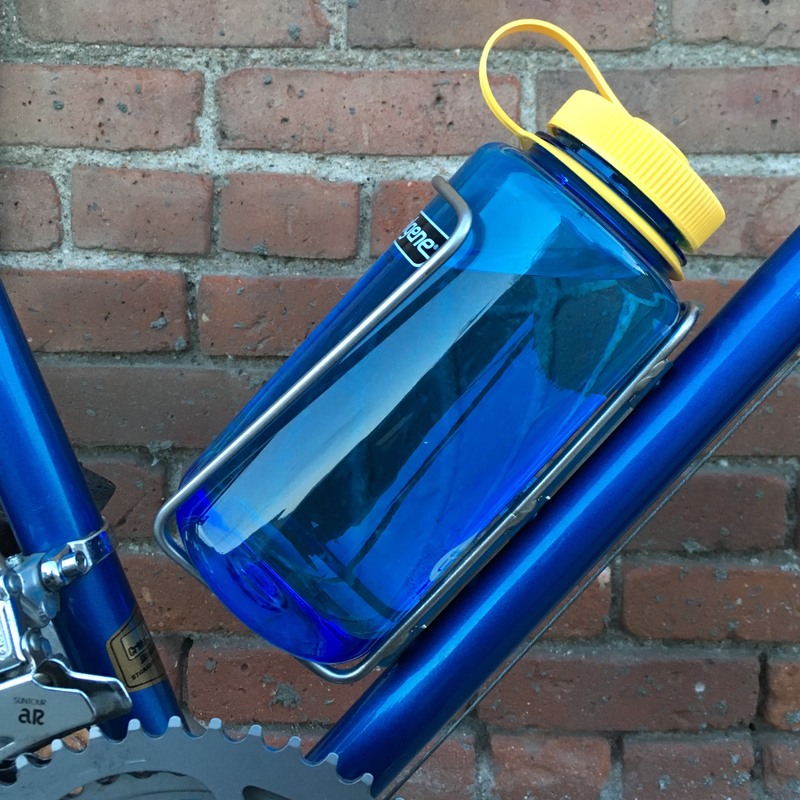 I would definitely recommend it as a quality bike accessory for easily carrying more water when needed. Don’t go anywhere without my giant Nalgene, now it gets to go riding with me too! Great construction on the bottle cage. Was a bit worried the weight of a full 48oz Nalgene would be too much, but it holds nicely. Still use a black strap to keep it tight though, just in case. Feels solid. Holds the bottle well. I may be spoiled by titanium many things cages but when I pulled this out of the box I was a little wide-eyed by how heavy it felt. I know that there’s a weight-strength tradeoff but honestly I’ve been caring a bit more about the weight of my rig in my old age. Two of these adds 3/4 of a pound to my frame! Badass cage. Build quality is amazing, clean welds (props to whoever welds these up! ), holds my nalgene nice and strong. Gonna buy another soon! This thing is awesome! It’s amazingly hard to find water bottle cages for nalgenes and this does just the trick. I hold my 1.5 liter bottle on rides and it’s a perfect fit, I do think the price point is a bit steep, but the construction is top notch. Will be using it on a upcoming 4000 mile tour with confidence. This cage looks like it was made with shred and stoke in mind. Holds my Nalgene perfectly secure as I bomb down singletrack on my rigid 27.5’er. Totally worth the price. I ordered this to be able to have a place to put my nalgene in my car, this thing is awesome, super build quality and holds snug! I ride 35-45 miles every other day for school. I hated caring a nalgene in my bag. Now, thanks to Widefoot, I can carry it on my bike. Freaking amazing! This is the second cage I own and will be putting them on my other bikes as well. Very well built, easily adaptable to almost all bike frames, and freaking awesome customer service. I will be putting these through the ringer over the Christmas holiday as I go on a bike packing adventure through New Mexico. Practical and ascetically pleasing I am very happy with my purchase. Thanks Widefoot! You guys rule!!! Made in the USA. Classic look. Stainless steel. Holds large bottles. Almost every other bottle carrier out there is crap compared to the LiterCage. I’ve got a single speed 29er because I like things big, simple and reliable…just like me. It holds my nalgene and hydro flask nice and tight. I mainly use the nalgene and it slips in and out well enough but still has enough tension that I can unscrew the lid while in the cage for one handed use while riding. Get one for every bike you have. If you have an older Jeep, mount one to your roll bar and have the best cup holder around. Seriously, stop reading this now and order one. The sticker is an awesome bonus to. My girlfriend and I used these on the very rugged Baja. Never lost a bottle (40z Kleen Kanteen and Nalgene) and didn’t even use any additional straps to hold them down. Great design. Rugged and lightweight! Love it! I had been looking for something that was large enough to hold a Nalgene and the Liter Cage has far surpassed what I wanted. It’s so nice to not have a water bottle awkwardly clipped to the handle bars of my bike. Very sturdy design, super easy to mount, fast FREE shipping and made in the USA! Thanks for the sticker too! Nothing else needs to be said. Get one!! First ride today with the new cage!! I love this thing. I was worried it might feel bulky, and maybe hard to forget during my ride. I was dead wrong! It held my nalgene snug the whole ride! This thing is seriously a steal for 25 bucks!! Made in the USA, Free (stupid fast) shipping, and a killer design… can’t go wrong! Thanks widefoot!! Love this thing! Was looking for a larger bottle cage to carry more water on my bike. So far the Widefoot is working out great. Also love the fact it is American made, and free fast shipping sealed the deal. Stoked! Finally! A cage that fits my Nalgene 3.5″ bottle! One minor suggestion for an improvement — I have a slightly smaller bottle (an Aquabot spray bottle) that is 2.75″ diameter, too big for most cages but too small for this. My husband squished the widefoot in a bit so it will work; otherwise, it falls out the bottom of the cage. So, add some sides near the base that come up an inch or two, just curved pieces around the sides near the bottom to keep bottles from falling out. Amazing cage. Easy to mount and use. Holds Nalgene bottle perfectly. Will be purchasing more. Does a great job of holding my Kleen Kanteen or my Nalgene securely on rough roads and trails. It can be a little tough to get the bottle into the cage but, maybe I just need practice. The cage is currently on the down tube of my size M Surly ECR. I’ll probably add two more to my forks for desert trips. Thanks Widefoot! Super fast/free shipping! Perfect for my over sized stainless steel water bottle. You can even fit a 30 oz Yeti tumbler in this thing so it’s awesome. I give it 5 stars, although I do wish that it came in black also, because now i’m having to spray paint it myself which is inconvenient, yet easy fix. Other than that, superb quality, I definitely recommend!! I’m 100% a fan of these cages. I originally bought one because I was searching for a cage to hold my beloved red Nalgene bottle. What ended up happening was it worked so well that I found myself swapping the cage back and forth between my bikes which got old. So bought a second one for my other bike. I also got one for my friend because in my opinion good things are meant to be shared. These cages are solidly built, work perfectly with 1L Nalgene bottles and are superiorly priced. Great product, great price, wins all around. Get one or more for every bike you own. You won’t regret it!!! ✔?? Burly design. It held my Yeti 36oz (heavy at 20+ oz empty) bottle firmly on the road and in mild-moderate off-road conditions. I will eventually be putting it through its paces in the rough stuff (straps on stand-by if necessary). Great product for the bike packer/trekker! Very solid and well made. Fits my bike perfectly and holds bottles securely. Does everything I wanted and looks very clean and simple while doing it. Also, I am happy they are made here in the USA. Great product! The cage is strong and holds my nalgene bottle tightly and securely. Took it on a longer ride over mixed terrain with it’s share of bumps and my nalgene stayed in the cage perfectly: not even a hint of rattling or bouncing about. Love that these have the multiple attachment options the 5 bolt holes allow. Highly recommend these cages. Very stoked on my new Widefoot cage! It is sturdy enough to hold my 40oz Hydroflask. The multiple mounting holes allowed me to find the perfect placement on my frame. Thanks! I am using it on my original Fargo, to boost the water frame-and-pack-carried to over 9 liters. So far, I like it allot. The 5 holes allowed me to position it lower on the tube so the 1L Nalgene could happen in between two other cages. Four stars instead of five because it has not been in the desert yet, just streets. This cage is amazing. The stainless steel is beautiful, well constructed, and compatible with all the BIG bottles I love. I’m a satisfied customer. I believe the LiterCage will last a long time and I like the versatility of attachment options. Plus the stickers, packaging, speedy delivery were all a nice touch. Thanks widefoot! If you make a tee with the Sasquatch logo I’d be interested. It was sure nice to have your bottle cages on my fat bike. One cage had my 40oz hydro flask filled with ice and water, and the other had a Nalgene bottle. When I drank all the water out of the hydro flask I refilled it with the water from the Nalgene bottle. It made my day of riding and hunting much more enjoyable having enough water to make it through the day. Thanks for a great product. The liter cage is one of the best things I have bought for my bikes. I have one on my pugsley, deadwood, and a chumba. Solid construction, American made, and I can carry enough water for a texas summer ride. I highly recommend this cage. This thing owns! I got this in the mail and at first look I remember thinking, “there is no way my nalgene is going to fit in there”. But sure enough, no issues. Within 2 days of receiving and loading it up my buddy and I decided to take it on an overnight camping trip. BAM, perfect. It was so nice being able to carry my liter bottle down low and not waste bag space. Recommended for trail ripping and BikePacking. Listen up, this liter cage isn’t like those other goofy looking “over-sized” bottle cages! This thing is independently functional, no need for silly straps or sliding adjustments. This cage squeezes the life out of my Nalgene no matter how bumpy the ride. Curious about adjustability? As you have probably already seen, this cage has 5 holes for bolt attachment. (Spaced 1-1/4 inches apart) so depending on your bike frame you can fit 2 inside of your frame triangle with your standard bottle bosses. And the best part, it looks clean and works well! Great product that is bomb proof and fulfills its purpose while keeping your bike classy! Just got my LiterCage a couple weeks ago and man does it make a difference not having a full Nalgene awkwardly shoved in my backpack. This cage has some premium welds holding it together and I don’t have any worries of my bottle falling out even through some pretty rough riding. No question, worth the money. I was lucky enough to get a couple of these cages earlier this summer for my wife and I and they are amazing. We used them all season and since the nice weather is still holding out in our part of the country I am still getting great use out of mine into December. They are exactly what I was looking for and make it super easy to carry a liter Nalgene bottle. The construction is solid and the retention is secure. This is a great product and well worth the investment. On top of that the customer service has been incredible. I worked with Hunter and he made me a customer for life. Very sturdy design. Held my Nalgene bottle securely on its inaugural ride. This cage will also carry my Lafuma 600 sleeping bag. Liter Cage is currently riding a Surly Big Dummy.